I was in love. He was the blue-eyed rascal, the master of the one liner. He was, by turns, cool and hot–matched by his partner who was hot and cool. The two of them wore their dusty britches like uniforms of hip scoundreldom, and they grasped six-guns in sure fingers. I didn’t even mind the girl who did whatever on the bike; all I wanted was to know that Paul Newman would be in the next scene, alongside Robert Redford. It was my first movie during which I sat beside my parents and felt that flush of love…or lust. The fact that Butch Cassidy and the Sundance Kid ended with the freeze frame right before they are blown away (oh, um, spoiler alert) was perfect: it meant my adolescent desires would always be arrested in Paul Newman‘s blue eyes. Butch Cassidy and the Sundance Kid was the funny movie, the movie whose script I continue to study as an exercise of flippant wit. The lanky grace of Paul Newman that caught my eye then still catches my eye when I see photos of Newman and his wife in their golden years. I saw him also in the unfunny movie Hud, in which he arrested me with his feral grace yet again, his loathsome qualities checked by, yes, those awesome blue eyes. 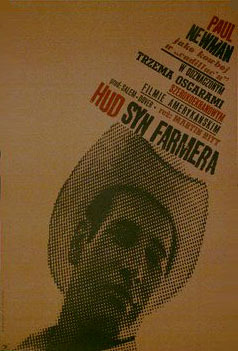 Hud is the kind of western story that makes you want to move to a big city. Its characters strive to hold their own against “progress,” all except for Hud, who is ready to bend whatever way it takes to get what he wants from life. In Larry McMurtry’s book, Hud’s Texas cattleman father always does what is right–and, uncomfortably, his moral bent may be the cause of Hud’s amoral streak. McMurtry uses his usual deft prose to weave a spell of generational conflict; it’s Newman in the film who makes the audience identify with such a rat. The movie came out at in 1963, just as the old school became aware of the potency of the new school. What comes across is fear of the new and disdain for the old. What survives is neither. What is memorable is Paul Newman. Homer Bannon: That’s your solution for getting out of a tight? To pass bad beef on to my neighbors who wouldn’t know what they was getting? Or maybe risk starting an epidemic in the entire country? Hud Bannon: This country is run on epidemics, where you been? Price fixing, crooked TV shows, inflated expense accounts. How many honest men you know? Why you separate the saints from the sinners, you’re lucky to wind up with Abraham Lincoln. Now I want out of this spread what I put into it, and I say let us dip our bread into some of that gravy while it is still hot. Homer Bannon: You’re an unprincipled young man Hud. Hud Bannon: Don’t let that worry you none. You got enough for both of us.